"What I love about your light is that you feel it emotionally as well as seeing it with your eyes. Wonderful stuff"
“My work is a celebration of the effects of light revealed in rich and vibrant oil paint using my personal visual language of fresh and direct brushmarks. Painting en plein air is central to my practice, and I travel to seek new experiences and fresh inspiration to feed back into my studio work. I have a particular love of coastal locations and gardens, allotments and interiors, favouring intimate and busy subjects over grand vistas. Keep up to date with all my news! I shall be hosting a painting holiday to the beautiful island of Symi in Greece in June 2019 with Spencer Scott Travel. Symi is a painters dream. It is probably the most quintessential sun-drenched island in Greece. It can only be reached by boat and has very few hotels so greatly appeals to artists and writers. Most of the 2500 population live in the pretty port town of Gialos. Its pastel coloured neo-classical villas and mansions cling to the hillsides above the perfect semi-circled natural harbour where the water is as deep a blue as the skies. The harbour area bustles with activity. There is a constant toing and froing of fishing boats, ferries and yachts and the quayside is lined with shops, tavernas and a clock tower. The old town is a maze of steps and alleyways and where there is an air of calmness and where life has changed little over the centuries. Children play in the alleyways, old ladies dressed in black sit crocheting on doorsteps, men gather under trees and in tavernas to play backgammon and cats sun themselves around flower pots. Click here to find out more and join me there! Vibrant Oils book is now available! It's been a couple of years in the making and I'm very pleased to let you know that my book 'Vibrant Oils' is now available to purchase here just ahead of it's official release date! It's very exciting to see so many of my recent paintings printed all together in a book form with such large clear images. It is also packed full with inspiration and advice on seeing and painting, as well as some stage by stage demonstrations. I'm very proud of it and I think you will love it. If you'd like a signed copy please let me know when you place the order, writing in the 'notes' section who you'd like the book dedicated to. 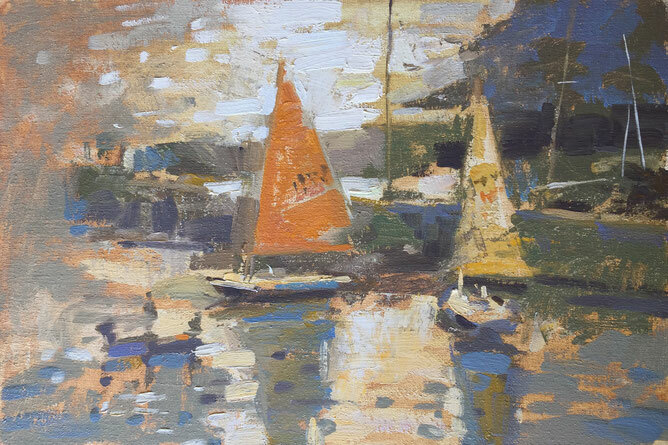 For my new DVD I was filmed painting five plein air works on the beautiful Roseland peninsula in Cornwall in and around Portscatho, St Mawes and St Just in Roseland. The video has been produced by the wonderful APV films. You can view the trailer and order your copy now by clicking here. For information about purchasing a painting and to see what's currently available in the studio please see the Available paintings page. For links to the wonderful UK galleries who stock my work, workshop organisers and recommended materials and products take a look at the Links page here. Please see the workshops page for details of my 2019 workshop, demo and painting holiday schedule.